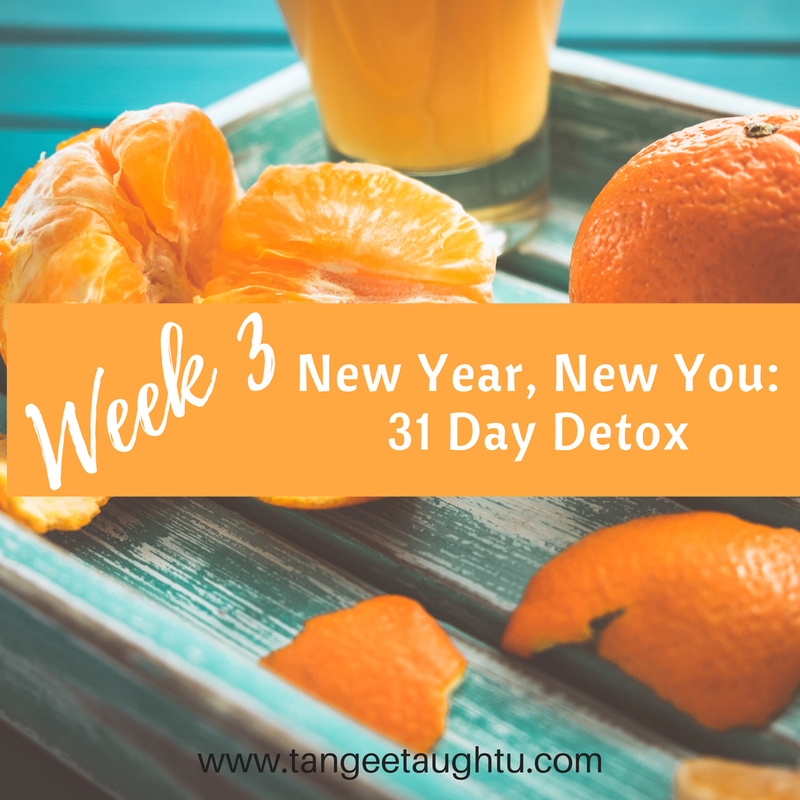 Wow, can you believe we are now about to begin Week 3 of the 31 day detox. How has your 14 days been? I have enjoyed this so much. All of the meals have been delicious. I’ve been noting my favorites so I can incorporate in my weekly meals following the detox. I am feeling like there is no reason to go backwards and even eat seafood again; at least that is how I feel right now, lol. This is your Week 3 guide that will cover the meals and practices from Janaury 15, 2017 to January 21, 2017. Toss all ingredients in blender, add ice, blend, and enjoy! Small fruit bowl or light salad of your choice. Practice Mindfulness. Pay attention to your surroundings; Name 5 things you see, 4 things you hear, 3 things you feel, 2 things you smell, and 1 thing you taste. Preheat oven to 350°F. Remove and discard seeds from each squash half. Remove flesh, leaving 1/4 inch-thick shells;chop coarsely. Set aside shells. Heat oil in large skillet over medium-high heat. Add chopped squash, onion and oregano; cook and stir 4 minutes or until onion is translucent. Remove from heat. Stir in rice, artichoke hearts, beans, mayonnaise, parsley, Parmesan cheese, and salt. Divide mixtures evenly among squash sheels. Place on baking sheet. Bake 20 to 30 minutes or until squash is tender. Sprinkle with mozzarella cheese. Bake 3 minutes or until cheese melts. Enjoy! Preheat oven to 375°F. Coat large baking pan with nonstick cooking spray. Heat oil in medium nonstick skillet over medium heat. Add bell peppers, onion, Italian seasoning and black pepper. Cook and stir 8 minutes or until vegetables are tender. Add garlic; cook and stir 1 minute. Stir in 1/2 cup marinara sauce; cook about 2 minutes or until slightly thickened. Let cool. Mix ricotta cheese with mozzarella cheese in small bowl. Unroll dough and cut into 6 (4×4 inch) squares. Pat each square inot 5X5 inch square. Spoon 1/3 cup vegetable mixture onto center of each square; top with cheese mixture. Fold dough over filling to form triangle; fold and pinch edges together to seal. Transfer calzones to prepared baking pan. Bake 15 to 18 minutes or until lightly browned. Cool 5 minutes. Serve with remaining marinara sauce. Visualization. In this relaxation technique, you form mental images to take a visual journey to a peaceful, calming place or situation. During visualization, try to use as many senses as you can, including smell, sight, sound and touch. If you imagine relaxing at the ocean, for instance, think about the smell of salt water, the sound of crashing waves and the warmth of the sun on your body. You may want to close your eyes, sit in a quiet spot and loosen any tight clothing. Rinse bulgar under cold water. Drain well; set aside. Heat oil in large saucepan over medium heat. Add onion and garlic; cook and stire 3 minutes or until onion is tender. Stir in zucchini and tomatoes; reduce heat to medium low. Cook, covered, 15 minutes or until zucchini is almost tender, stirring occasionally. Stir bulgar, broth, basil, and pepper into vegetable mixture. Bring to a boil over high heat. Cover, remove from heat. Let stand 10 minutes or until liquid is absorbed. Stir gently before serving. Enjoy! Heat oil in large saucepan over medium heat. Add vegetables; cool 5 minutes, stirring occasionally. Add garlic; cook 1 minute. Stir in 1 cup broth, curry powder and red pepper. Bring to a boil. Reduce heat. Cover; simmer 6 minutes. Stir in chickpeas, raisins, and salt. Cover; simmer 2-3 minutes or until vegetables are tender. Meanwhile, bring remaining 1 cup broth to a boil in small saucepan over medium high heat. Stir in couscous. Cover; remove from heat. Let stand 5 minutes. Fluff with fork. Stir cilantro and almonds into curry. Serve over Coucous. Enjoy! Progressive muscle relaxation. In this relaxation technique, you focus on slowly tensing and then relaxing each muscle group. This helps you focus on the difference between muscle tension and relaxation. You become more aware of physical sensations. Preheat oven according to pizza crust package instructions. Brush pizza crust with olive oil. Combine red pepper flakes and basil in small bowl; spread evenly over crust. Top with mushrooms, roasted pepper, zucchini, green onions and mozzarella; sprinkle with red pepper flakes. Bake 15-20 minutes or until crust is crisp and cheese is melted. Enjoy! Call a friend. Share goals. Plan a meet up that includes some positive vibing. Preheat the oven to 425°F. Lightly oil a baking sheet. Remove the stems from the spinach. Heat the rest of the oil in a saucepan, add the spinach, cover, and cook for 2 minutes. Uncover, stir, and leave to cook for 1 minute. Drain off the liquid, transfer the spinach to a bowl, and set aside. Rinse and dry the tomatoes; slice off and reserve tops. Discard the pith, seeds, and juice from the center of each. Lightly toast the pine nuts, then add them to the spinach. Peel the garlic and crush it in, then grate over the cheese, season to taste with salt and black pepper, and mix. Press the spinach mixture into the tomatoes, piling it up, then replace the tops, balancing them on the stuffing. Bake on the top shelve of the overn for 12-15 minutes. Serve hot and Enjoy! Coarsley grate carrots and set them aside. Peel and roughly chop the garlic. Chop enough cilantro to make 6 tablespoons. Drain and rince the chickpeas and put them into a food processor or blender with the garlic, cilantro, cumin, and coriander. Process to rough paste. Add the carrot, egg, and flour and process briefly until evently mixed but slightly chunky. Heat the oil in a frying pan and divide the mixture into eigth fritters. Fry in batches for 2-3 minutes on each side, until golden. Drain on paper towels. Serve in buns with salad. If necessary, you can make the fritters in advance and fry them later. Enjoy! Drink water throughout the day. See previous post about Infused water !!! Dont make this hard for you! Shop for all of your groceries online and have someone else shop for you. I created an account and have taken advantage of the Walmart grocery pick-up. You can sit on your desktop or the app and input exactly what you need from the ingredients list. You pay and then select time to pick it up. This takes away the stress of having to search for ingredients. I suggest only purchasing from Sunday- Wednesday and then Thursday- Saturday to avoid fresh produce from becoming rotten. Choose an exercise that works for you. I am trying out the TempleRecon 4 week workout, but if you have reasons why you are unable to do this type of intense workouts then go at your own pace whether it means a treadmill or long walks. Work smarter, not harder. Prep! See previous post Prepping to Save Time & Money. I will be chopping, slicing, dividing, labeling, and bagging or jarring up mostly all of the ingredients this upcoming weekend so each day I can come home and just toss, mix, combine, etc. Contact me if you have questions at write2tangee@gmail.com.